But plenty of boats and planes! I was up early, traffic divertions made my outward car journey three miles longer than the final lap home. I parked my car and headed for my first bus of the day. 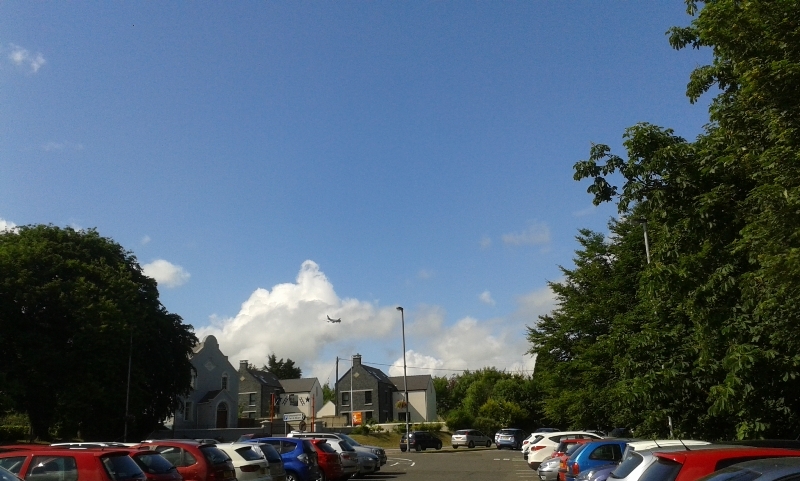 The sky was the colour of my jumper and that plane was heading for Belfast International Airport. There were plenty of people waiting for the bus and another joined our throng within a few minutes. We knew each other since Elly started school ‘cough’ number of years ago. He followed me onto the bus and sat together talking our way to Belfast. 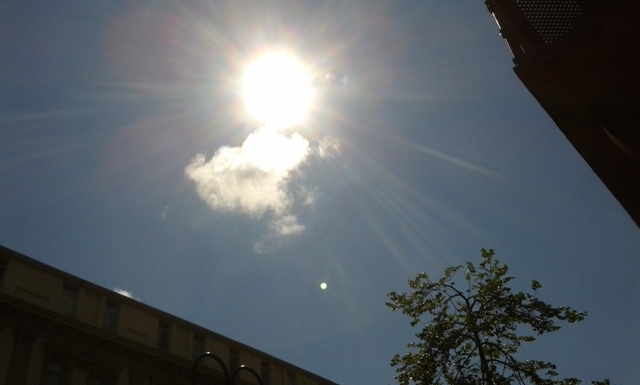 The sun was still high above when I got to Royal Avenue, Belfast. A cup of coffee later and I was ready to head round the corner to catch the FREE Event Bus at Wellington Place for the short journey to Pollock Dock. This service ran every five minutes, in my case to Pollock Dock. There were three other Park & Ride points: Boucher Road, Airport Road West and the New, (yet unfinished but open for the four days) Ballymartin at junction 5 of the M2. I could have walked from town but decided to save my energy for the event itself. The ships were spread between Pollock &York Docks, Donegall, Albert and Queen’s Quays and Albert Basin. Another Event bus too people from dock to dock. That was more than enough walking for me on a hot day. A good comfortable crowd, but I expect the numbers to increase this evening and on Friday & Saturday when the last night finishes with a fireworks display. On Sunday between 11.00hrs and 15.00hrs the ships will form a parade leaving the port of Belfast, hoisting their sails heading for the start line of Race 1 to Norway. Then I had the head staggers and flew like a bird: Twists, turns and total flip overs, we had smoke everywhere …. I was hanging on so tight, I could no longer take photos. Somebody hold my Elly down …. I was in a Red Arrows Flight Simulator! Then it was time for home and a little thank you for my feet! 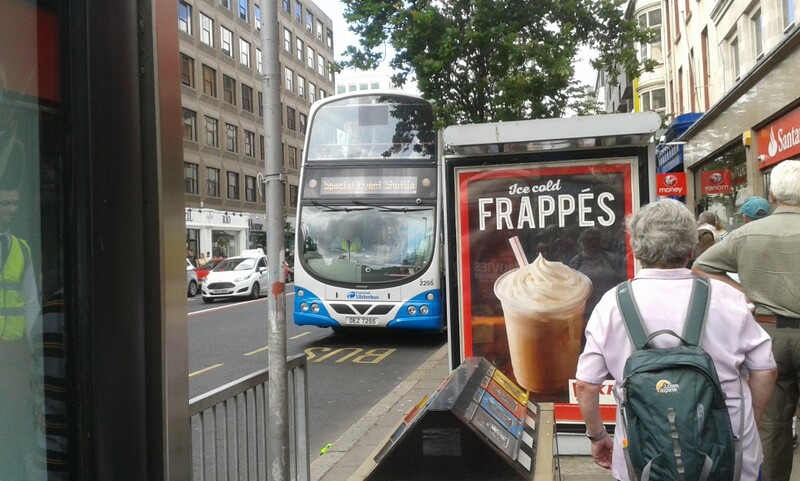 This entry was posted in Fun, Uncategorized and tagged Lid, The Tall Ships 2015, Translink. on July 2, 2015 by Grannymar. I would be more worried about my old knees! It was a wonderful day spoke to plenty of people, eat my lunch while people watching, and now I need to close my windows, I can see the rain, it is less than ten minutes away and we might be in for a noisy night! My patio now has freckles, so the rain is here. There were plenty of sailors and they were all happy with the world. I love meeting people, they all have a story waiting to be told! I’m hiding under our new patio umbrella – I swear it is the size of the neighbour’s conservatory! Hubby is doing his thing, I am doing mine – peace all around! I adore people watching, too. I make up stories for them, when I don’t get to say hello myself. I am heading for my bed, a good rest is what I need. night night. The last photo is a hoot. Did it help? It certainly did Dianne. I came home, removed my sketchers, changed my trousers, made a cup of coffee and filled the basin, then sat to catch up with the world of the internet! Jenny and I went along in the afternoon. Personally I was a bit disappointed by the lack of information about the ships, and by the overwhelming commercialisation – so many stalls selling food and drink and knick-knacks and what-have-you. I would have preferred more focus on the ships and less on selling stuff. But clearly lots of people were having a great time. Nick, there was plenty of commercialisation, but I did not go for that or the fun fairs, so I ignored it. I concentrated on what I wanted to do and see: Tall Ships and to talk to real people. I brought my own lunch & fluids with me and all I spent was £5 donation for the trip in the Red Arrows simulator. I heard as I got back into Belfast that there was even free ice cream from one of the stalls. Sounds like a fun time. Love your photos. I thoroughly enjoyed my day Gigi, Tired feet were worth the experience. I can hear the wind shipping the sails! Shame they wouldn’t let you climb the rigging. There was not even a puff of wind yesterday, it was very pleasant – just right for me! Belfast was host on two other occasions to the Tall Ships in 1991 and 2009. Jack, a young Elly & I went along for the first visit. The crowds were enormous with little space to move or get near the boats. This year it was very well orgsanised. A totally free event for all visitors. The commercialisation mentioned by Nick, probably helped to pay for a tremendous number of young visi vested helpers who were willing and able to answer all questions. A wonderful atmosphere all round. I have friends (a couple) who took a 5 week trip on a tall ship (sailboat). Everyone there was the crew. They manned the boat, did all the work. IMAGINE 5 weeks of that! Most everyone was sea sick the whole time. Grannymar, you had it easy in spite of the sore feet. BHB, I would have loved that opportunity a few decades ago. The trip was from Argentina to Cape-town S. Africa. There were 30 paying ‘guests’ & 8 were sick the whole time. Don Liska (a world-wide mountain climber) climbed to the top of the mast. Alice climbed but was too chicken to climb Clear to the top, because there was no belay, like the ships in the 1700s. Don’s picture was in the Cape-town newspaper. I saw the Europa Yesterday, it was one of the last ships to arrive into the Port. what a grand day out…. Wow. What a grand day. It really was, Shackman. I am glad I went on Day 1, the crowds build with each day and today Saturday, we have rain and nature’s fireworks to contend with. Hey Missus, you are not old. You are ageless. You know what? Some of those photos remind me of our trip to Howth a few years ago, when we met in Dublin. A lovely memory. Hello stranger, it is good to hear from you. I remember well our day in Howth, a favourite spot of mine. Hope all is well in your corner, Maria. I got a tour of the tall ships in Boston several years ago and it was a lot of fun. I did not manage to go on board any of the ships, the tide in Belfast lough was at full height thus considered dangerous to allow the public access. By the time I wandered the the full area, I had talked myself dry and shortened my legs about six inches and the idea of standing in a queue for an hour had lost its blas. Jenny and I watched the Red Arrows’ display at Carrickfergus today. I’d never seen the Red Arrows before and I was riveted by their flying skills. I thought about heading out this morning, but was distracted by a couple of calls so changed my mind. Glad not I didn’t go.The Red Arrows are amazingly talented guys. The simulator was enough for me, Not sure I would like to fly in a real one! John, I am saving your blushes, my knees are not a pretty sight these days!